On Tuesday, outside the town hall-sized parliament in Reykjavik, a small crowd kicked the fence, banged pots and pans and threw eggs at the building. The Icelandic Prime Minister Sigmundur Gunnlaugsson had just stood down over allegations he had failed to disclose his interest in his family's offshore account. He was the first political casualty of the Panama leaks scandal. The prime minister has not been accused of breaking any Icelandic law. No matter. The impression of a conflict of interest and of a lack of transparency was enough to bring him down. A sizeable number of the crowd huddled against a biting north-east wind simply would not accept a leader with links to offshore havens. This is a small country that only recently had almost been brought down by failed banks using shell companies in tax havens. What made the disclosures even more sensitive for the prime minister is that he was overseeing negotiations over the failed banks. There is a new politics that has grown out of the financial crash in 2008. What was once confined to the margins of public debate - tax havens, bank secrecy, corporate tax rates, tax evasion - has seeped into mainstream politics. The actions of the global elites feed the strain of anger detected in European and US politics. In 1994, I presented a three-part BBC One series called Dirty Money. There were examples of cartel members dropping off cases of cash in British dependent territories in the Caribbean. But by far the biggest business was providing shell companies. These were islands of secrecy and the flows of money that passed through the offshore banking centres were immense, but it was hard to spark political interest. I recall, however, speaking to a Senate aide on Capitol Hill who said to me: "Nearly every major crime in the United States had a financial link to offshore havens." The financial crash of 2008 changed everything. Politicians could no longer look away. The revelations eroded trust and voters began to engage with the world of finance. Rogue traders had dealt in sub-prime mortgages. Others had rigged markets. The investments of banks had nearly brought down the Irish economy. Banks, which were too big to fail, had to be bailed out by taxpayers. Politicians and voters paid attention. In this climate some of the walls of bank secrecy - like in Switzerland - have been breached. Offshore havens are being squeezed. For the past five years, Europe's leaders have been working on legislation to ensure that, in future, taxpayers will not have to stump up for failing banks. The post-2008 world has also focused attention on inequality. Certainly in the United States one of the main political questions of this election year is whether the system works for the many or for the few. Media captionPresident Obama said the leaks make "hard-working Americans feel the deck is stacked against them"
Many of the new jobs are low-wage. In real terms the wages of the middle-class have fallen since the crash. Unemployment, although gradually falling, has remained stubbornly high in Europe. So in a time of insecurity, who pays what tax matters. The European Commission has promised to crack down on tax avoidance. On Tuesday a Commission official welcomed the Panama Papers, saying: "The global focus on this issue provides us with the momentum we need to drive forward our agenda." European Competition Commissioner Margrethe Vestager described the Panama Papers as the "tip of the iceberg". Several governments have promised to launch investigations into the individuals named in the documents and to recover money if there is proof of illegality. In the post-crash world the amount of tax that companies pay plays high in the minds of voters. Image caption European Competition Commissioner Margrethe Vestager says the Panama papers are the "tip of the iceberg"
Here, too, the momentum is towards change. The European Commission will shortly put forward plans that would make large companies disclose how much tax they pay in each member state. The former Icelandic prime minister insists that he has done nothing wrong but in the new politics denials are no longer enough. 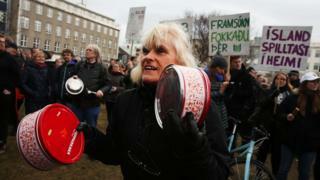 Iceland faces a period of political uncertainty with many demanding not a change of prime minister but fresh elections. There are legitimate reasons for placing money offshore. But voters still trying to recover their security from the crash of 2008 are not in a trusting mood. Their frustration fuels a new politics, mistrustful of elites, angry with the perceived failures of mainstream parties and suspicious of politicians and the world of finance. The crash of 2008 is still shaping politics.